After three kids, I finally got the timing right for going to Disney. Lucia, age 3½, is at the perfect age. She is right smack in the middle of her Princess phase, and got to revel in extreme princess-ness at Disney. She even got a Snow White dress and wore it all day (favorite moment was when a pack of Japanese girls saw her and started screaming and had to take her picture). I’d been to Disney World in Orlando before and, frankly, found it soulless and depressing. Maybe my kids were the wrong ages. Maybe I was a snob. But Disneyland felt different. It exceeded my expectations. For some reason I had thought it would be “less” than Disney World, but in its vintage authenticity (I love that Tomorrowland was based on the year 1986), I found my little-girl dreams coming true, right along side Lucia’s utter joy. Except, that is, when it came to the food. Oh, I was warned. And I remembered Disney World’s disgusting fare. But this was 2010, in California, for lawd’s sake. Surely, something should have improved. The thing is, you get so hungry that you HAVE to eat it. And it was all lukewarm and one day away from rancidity. There were plenty of places that could have featured organic, healthy food, but no. Nothing. Nada. As I pushed my way through what can only be called stroller wars, I thought, “What a missed opportunity for the world’s families and children!” With one phone call from a top Disney executive in Burbank, organic food could become the best, right choice. And the health of the whole world’s children would immediately improve. Coming to Disneyland fresh from the Natural Products Expo, I knew that yummy organic products that kids love are out there, and easy to provide! I think if Walt were still alive, he would have wanted it that way. Maybe one day, my dream will come true! Eat The Whole Damn Egg! Yet another venue, yet another battle. Go for it! Good healthy food, here comes Maria! bring people what they want in this day and age! I think Whole Foods goes to famous Concerts!!!!!!!! You’re really full of it, Maria. I can’t imagine where you ate but after over 50 years of going to Disneyland I can honestly say I have NEVER gotten rancid food, EVER! There is fresh Organic food all over the place! How could you miss it? We used to take along organic healthy snacks……..10 years ago! Now they have: nuts, fresh fruit, all kinds of fresh veggies, pickles, seeds, popcorn, etc. There are many, many resturants serving good, reasonable food now. It’s NOT old, it’s not spoiled. I think YOU’RE the spoiled, rancid one. Disney should SUE you. To write an article like this one, so negative, so UNTRUE. You don’t help anything, you just make people who like organic food look like idiots! Stay home, tell your lies to your friends, not in an article that some people might think is true! I’ve lost all respect for you, not just because you RUINED the Organic magazine either. You’re just a JERK! In reply to Angelas note, I know that free speech is a right given to every American, however it is not right to call people names, didn’t your parents ever tell you that……. reverting to that is just childish. I suggest if you don’t like reading this blog, and don’t agree with Maria, which apparently you don’t, save youself the anger and have your name removed from the e-mail list. That certainly does not sound like the way a Disney princess should speak to anyone. Poor dear Angela has a serious emotional problem or is a paid Disney blogger? of Caribbean isn’t too bad. The first and last time I was at Disney was in 1981, so I cannot comment on the food there. Just that MARIA, you’d better try to be a bit more specific when talking about something, otherwise I’m afraid another virulently angry individual may do more than call you names. There are a lot of angry individuals out there. Most of us are already on the edge. Tread carefully! What a tremendous opportunity, Disney would have a captive audience to show consumers organic choices. Doesn’t that belong in “tomorrowland?” Perhaps you and Michelle Obama can work on that. p.s. never let a troll get you down. Maybe the healthy and organic food at Disneyland wasn’t properly advertised and hard to find? Kudos to Maria. What a great opportunity for Disney to either jump on the organic/healthy food wagon or maybe change their marketing so health conscious consumers know where to go. I have been favorably impressed by the changes that Disney has made in the food choices. To give Angela credit, she’s right that there are now tons of healthy snack choices available (at Disney prices mind you) – apple slices, carrot sticks, fruit cups, nuts etc. They are available as side dishes in the fast food restaurants and also at the snack stands. They may not be organic produce, but hey, it’s a HUGE improvement over only having french fries and ice cream to eat. RE: Angela’s comments. There are ways of tactfully getting one’s point across without immature, unnecessary name-calling! I have not recently been to either Disney venue, so I cannot comment on organic it’s food status. However, I do feel compelled to comment on the vulgar nature of Angela’s comment. Readers must remember that Maria is writing about her own PERSONAL EXPERIENCE. That’s what her blog is all about! And I enjoy all of them! So Maria, thanks for the “heads-up”. When I do plan to visit Disney, I will-just in case- bring my own snacks & food bars, OR if I am lucky enough to find fresh food as stated by others, then there you have it! LAURA IS RIGHT. Can’t we be adults here? We are always after our children to watch what they say and no name-calling, yet we are the examples for our children. I understand that we get very angry sometimes, and may have had a hard day or a very bad week, nevertheless,we can still be respectful of others and their personal opinions. Either do that, or don’t write anything until you’ve calmed down. There are times in the past (and present for that matter) that I wanted to be very nasty to some of those so-called political journalist/news people on Fox TV, but, they are entitled to their opinions and I mine. We can agree to disagree and remain civil towards each other. Sorry your trip was so disappointing. Our recent trip to WDW was surprising in the number of healthy choices available (alongside the funnel cakes, chicken strips and fries, mind you. ) Each place we ate had healthier options (even if it was an apple or a tossed salad.). And no issues with freshness, either. You might be interested to know that Disney does some hydroponic gardening at Epcot with those items served at the restaurants at “The Land.”. I know it’s antibiotic and pesticide free – I’m thinking that’s a great start. How inexpensive could they provide organic goods there with their buying power! Possibly even fund the local movements in Orlando and Anaheim. Great idea! By the way, the trip was not disappointing at all! 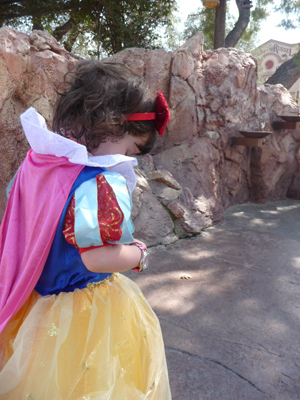 We LOVED Disneyland…it was just the food that I felt could be powerfully improved by going organic. I agree there were many healthy options, but they were NOT organic, and frankly the food I had did not taste great — organic, healthy or not. I agree with Deb W. With Maria just having come from that expo, I would probably feel the same way. I agree with Laura B. The name calling was completely unnecessary. This is a blog, a means to share ones experiences. Maria, what I have gleemed from your post is that I should be prepared when I venture out to theme parks. Nothing is truly as good as your own. Dear Maria, I’ve been trying to find “unsubscribe” ever since I commented on this posting and can’t seem to find it anywhere… (On what’s supposed to be the link to “unsubscribe here” just keeps coming back to your blog). I only want to comment occasionally, do not want to receive “junk mail” and I’m getting kind of frustrated with this. This is obviously a glitch, right(?) Can you help?? Hello Maria!! This weekend was my first time to post something on any site… imagine that one! I’m a newby, and didn’t expect to be receiving all these responses…obliviously, I can’t find where I can exit out from receiving so many response e-mails. I am surprised how many I’ve been copied on. And, I’m leery of so many from unknown-to-me responders. When I read your sight, and occasionally if I’d like to respond, I will, but I haven’t spent my time on blogs before , so …HELP please! I agree with you Maria , It would be great if Diseney would go organic. It would turn a lot of people to it. I love your passion Maria and the commitment to your vision for a healthy America is inspiring and so needed. Bring it on agent of change! Hmmm…well I know I am late to the party but I’m going to Disney World this week and I can tell you guys what I find when I get back. I don’t ever remember ever getting bad food at Disney (my dad is a Disneyphile and goes twice a year! Me, I haven’t been since ’07 but I’ve been a total of 10 times), some food wasn’t that great but it’s a big park so you’ve got to expect bad food at some point. I am almost certain that the Signature restaurants carry organic food and while a lot of the counter service is your standard park grub (hamburgers, hot dogs, etc.) you’d be surprised what kind of variety you can find. Epcot, for example, has an outstanding table service restaurant at The Land that serves organic food but if you were expecting to find organic food in Disney it would be here. The Animal Kingdom does as well from what I recall but here, as with Epcot, the focus is conservation and sustainability. The two sit down restaurants in the Contemporary resort are both entirely organic. I ate at the Wave and the food was excellent. They even have organic beer. Wolf Gang Puck’s restaurant at Down Town Disney has at least one organic entree, a chicken dish that was excellent. I thought the Land had organic food but I didn’t see anything that specifically organic. However, they do grow a lot of the food eaten at Disney restaurants right there at Epcot so I guess that’s something. The Land still has the best table service anywhere in the Parks. I didn’t eat at any Signature restaurants this time I went but I’ve seen organic offerings there in the past which makes sense, as organic food is typically more expensive. Perhaps that is why they haven’t gone entirely organic in all the parks, Disney likes making money not spending it. If all their food was organic it would probably be too expensive for the average American to afford. Plus, those who are looking to eat organic are usually of a higher socio-economic status than those who aren’t hence, organic offerings at more expensive sit down restaurants. So Disney Organic, it’s there, you just have to look for it. I suggest perusing the menus at All-Ears.net otherwise, just go to Disney and have fun. Listen, I don’t think that Angela understands what “organic” means in terms of food. Organic means produced without any synthetic pesticides or fertilizers that are harmful to humans, ecosystems, and the planet at large. It doesn’t mean fresh, good-tasting, or “natural,” all though it most certainly can be all of those things. It means that your cow’s milk is not produced with the aid of hormones, nor your meat, nor are your apples and strawberries bearing the carcinogenic and neurotoxic residues of dozens of synthetic (petroleum-based, I might add) pesticides and fertilizers. Judging by how nearly impossible it is to locate organic food for my toddler at any restaurant, I would be truly astonished if Disney offered anything beyond an organic boxed milk. But if they did, I would forego my packed picnic lunch and buy, buy, buy!!!! A word to Disney: do it. It will make you money. Went yesterday. I packed my own organic vegetarian food. Didn’t see any “Wave” restaurant on the Disneyland side, so maybe it was on the Adventure side. Everything I saw being served was total crap, and me and my kids just laughed at all the fat people eating burgers n fries n sh_t. What a pathetic state our species has evolved to. We are season pass holders, and I have looked high and low for any USDA certified organic food, anywhere, to no avail. People like Angela simply don’t seem to understand what “organic” means, so let me elucidate the term. “Organic” has a very specific, very precise, legal meaning. If a food is certified organic, it has not been grown with toxic pesticides or petroleum-based fertilizers. It means that you, your children, farmworkers and their children (who bear one of the highest body burdens of pesticides in the world), the soil and air and water are all protected from neurotoxic, endocrine-disrupting and otherwise terrifically horrid chemicals. It also happens to mean that no GMO ingredients are allowed. “Organic” does not mean “natural” or “vegetarian” or “unprocessed” or “whole.” It means a more ethical way of eating that is more sustainable for everyone. That said, I have really looked everywhere for organic fare at Disneyland or California Adventure. Even Starbucks, which actually carries organic boxed chocolate and vanilla milk in their ordinary shops, doesn’t have anything organic. So you know what I do? I bring all my own food. Everything. And the security guards have yet to say anything. If they did, I would simply say my child has a life-threatening allergy and cannot eat what they offer. Maria – I know this is an old post, but do you want to try to take this issue on? I just returned from Disneyland with my three kids. I felt there was a big effort to offer healthier choices. But not ONCE did I see the words “organic” or “local.” It seems like Disney can afford to be more choosy about where they are sourcing their food, and could be a real change maker in this game. I might be delusional, but maybe, just maybe, it is worth approaching them?